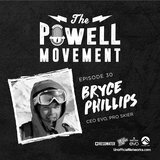 New podcast with Bryce Phillips. Andy Parry coming a week from Monday!!!! Been a long time since I posted on here. Hope everyone is having a good summer and ready for some podcasts this fall/winter. I'll launch a new episode every Monday and you can get em on itunes, stitcher, http://www.thepowellmovement.com and many more places. Please note that my Sponsored Podcast with Powder will not return for season 2--so please subscribe to The Powell Movement. Here is a direct link to the Bryce Phillips (EVO) podcast http://bit.ly/2w1KyLK and Andy Parry will be out a week from Monday. Hyped these are back!! Thanks for bringing back the podcast, always a good listen. My favorite Powell Movement podcast. Fascinating hearing the Evo creation story. Is Powell toning down the creepyness? Well, I gotta respect your owning it. Are we going to hear any more episodes with some OG's like McGovern this fall? Jimbo Morgan? Scot Schmidt? You know, I don't have too many OG's in the mix for Fall other than Pollard. I'll get on that. Is Sponsored returning as well? Sponsored is not coming back for Season 2. This was not my decision. Interesting I just saw this post. This is an awesome podcast NS and within the past 45 seconds I just got done listening to the podcast with Mr Bishop. Do yourself a favor and put it on your phone laying in bed at night. Awesome insight about NS and Mr Bishop. Glad I found these, they are all good. PowellMovement Sponsored is not coming back for Season 2. This was not my decision. It's all good. The Powell Movement podcasts are longer and more in depth. I have a lot of interviews in the can from Hood and a lot lined up. At the end of the day, it's best that I work with people that are focused on the future--digital, not print.